FILE - This July 18, 2014, photo shows buildings, to the right of the bridge, that are to be demolished as part of a redevelopment plan in the Maspero neighborhood of Cairo, Egypt. Egyptian authorities are demolishing the 19th-century neighborhood to make way for high-end housing and business development. Egyptian authorities are demolishing a historic 19th-century neighborhood in Cairo to make way for high-end housing and business development a stone's throw from the Nile, angering residents who say they have not been properly compensated. The Maspero neighborhood is named for French Egyptologist Gaston Maspero, who helped found the Egyptian Museum. Developers have long eyed the central district, which is already home to the Foreign Ministry and the state television and radio building. Heavy machinery is used to demolish buildings in the Maspero neighborhood of Cairo, Egypt, July 31, 2018. Egyptian authorities are demolishing the neighborhood to make way for development, angering residents who say they have not been properly compensated. Authorities spent years persuading residents and shopkeepers to leave the area in exchange for compensation or temporary accommodation elsewhere, with the promise of moving back to the neighborhood once modern housing had been built. The redevelopment is part of a larger effort to transform Cairo, which is home to 20 million people, even as a new administrative capital is under construction in the desert 45 kilometers (30 miles) to the east. 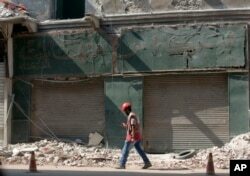 Last week, Cairo's governor said Maspero was completely evacuated, paving the way for the final phase of demolition. 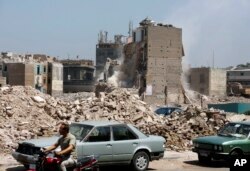 "Building houses for those  families will be the first phase of the project,'' Governor Atef Abdel-Hameed said. A worker walks past the Hinhayat watch shop, which was established in 1907 by a Bulgarian craftsman, that is being removed in the Maspero neighborhood of Cairo, Egypt, Aug. 11, 2018. Ahmed has sued the government, saying the shop should have been spared demolition because of its historic value. He said authorities told him he would be compensated only if he dropped his cases. The government insists the compensation offered is fair and denies it is forcibly relocating anyone. "It should not have been demolished. It should have been renovated,'' he said.